The ALBERTA CENTRAL RAILWAY MUSEUM, south-east of Wetaskiwin, will be open from May 17th through September 2nd this year, with a number of special occasion days planned. June 9th will be Alberta Central's 21st Birthday which will be celebrated with a pancake breakfast from 10:00 am to 11:30 am and as a Sponsors and Volunteers Appreciation Day. On June 16th the museum celebrates Fathers' Day with half-price admission for Dads with Kids. The July 1st Canada Day Celebrations will be highlighted by Tea and Pastries in the Cafe Car, VAL DAVID. July 14th will be Children's Day with a Teddy Bear Picnic at 2:00 pm, and free train rides for children with Teddy Bears. August 4th will be an Ice Cream Festival with free homemade ice cream at 2:00 pm. 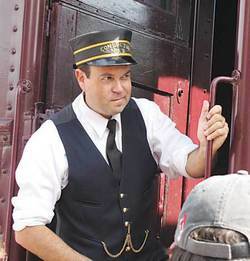 August 18th will be ALBERTA CENTRAL RAILWAY DAY, the biggest event of the season with a number of special activities including a Pancake Breakfast from 10:00 am to 11:30 am, Beaver Tails served from 1:00 pm to 3:30 pm, train rides, speeder rides, horse-drawn wagon rides, model train exhibit and collectors show, telegraph exhibit and service demonstrations, spike pounding demonstrations, and more. Alberta Central Railway Museum is much, much more than a short passenger train running on about a mile of track through the field around the museum site, although that brief experience of passenger train travel does give some sense of the pleasantness of travelling by train. There are a number of rail cars that were designed and used for specific purposes, signal systems, authentic buildings which each had a particular use, various specific tools and equipment, the many items the railway workers needed to keep the railways operating efficiently and safely. There are also photographs and brief written accounts of places and events important to Canadian Pacific Railway history, especially in central Alberta. A grain elevator from Hobbema preserves the memory of the original method of shipping the grain harvest. The guided tour, which is part of the admission, will help to get a greater understanding of the inner operations of the railways, especially in the past. An exciting new addition to the museum is the acquisition of Rail Diesel Car 9108, one of the Dayliners of the type which ran between Edmonton and Calgary in the 1950s and 1960s. Their original schedule saw Dayliners leave each city before nine each morning and again around five each evening. This meant that anyone could catch a train in either city or at any station along the way, have most of the business day in either city, and be home again for the evening. As a university student, I didn't have extra money, but I considered the Dayliner very well worth the cost of a couple dollars more than bus fare because it was so much faster, smoother and more comfortable for those occasional trips home for a weekend in Wetaskiwin or Lacombe. Then the Trudeau government decided to decimate the railway system, so the schedule was changed so one couldn't get a full day in either city, usage fell and was used as an excuse to stop the Dayliners. The original one-room Rosebriar School has also been moved to the Alberta Central Railway Museum site, and is nestled in the trees along the path to the elevator. There are plans to arrange occasional demonstrations of authentic one-room school teaching-learning experiences. Alberta Central Railway Museum has an impressive collection of authentic railway cars and equipment that were specifically used by the Canadian Pacific Railway. Railway history is important to retain, because the railways played such an important role in the formation of the nation by uniting it from coast to coast, and by transporting settlers and supplies to Western Canada. Before automobiles or trucks existed, railways spanned the continent providing mass transportation that was infinitely faster, safer and more comfortable than the previously available horses or river boats, including canoes. The actual operation of railways has changed with the times, but they still provide the most efficient transportation of mass freight over long distances, and still provide one of the finest and most enjoyable means of passenger travel where available. Alberta Central Railway Museum is an excellent source of the information and understanding necessary to really appreciate such an important part of our history.